Fall has always been my favorite season. Treat yourself to some holiday crafting while getting outside and enjoying the crisp weather! I have been experimenting with felt and falling for it (pun intended!). We carry a wool/rayon blend felt in both pre-cut squares and by the yard in a 36" width. This felt, because of its wool content, can be felted further to give it some more thickness and softness. Left unpressed, it has a Sherpa texture, similar to that of a crinkled leaf. To give your felt this texture, simply rinse under warm water, ring it out, and throw it in the dryer on high heat. One piece shrank about an inch in the length and almost three inches in the width. 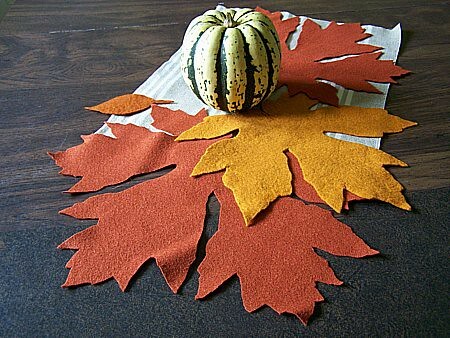 If you would like to do this with your felt I would suggest felting the pieces FIRST before you trace and cut out your leaves. Now on to the making! 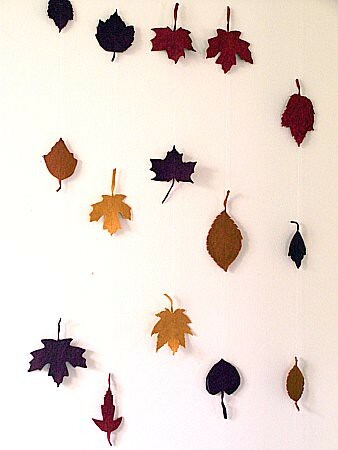 This project was so much fun and brought out the inner child in me, running around filling my pockets full of leaves. Start by putting your kids to work collecting their favorites. If your crew is inquisitive, grab a book at the library on trees and make this a educational project with identification of leaves and trees. What trees are native? What type of trees are planted in your neighborhood? After your walk collecting some nice shaped leaves, get tracing. 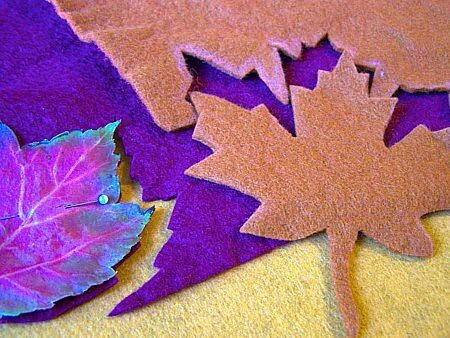 Use marker, chalk, or just pin the leaf right on to your felt piece. Cut them out and start sewing! The garland was sewn together using Gutermann's invisible thread. This thread is thin (almost like fishing line), strong, and truly invisible. It is such a great tool for crafting because there is no need to match thread colors with your project. I used a long straight stitch along the center length of the felt leaf shape. Once you get to the edge of your leaf (and with your needle up and the presser foot lifted), pull both the top and the bobbin thread at the same time to create gaps between your leaves. 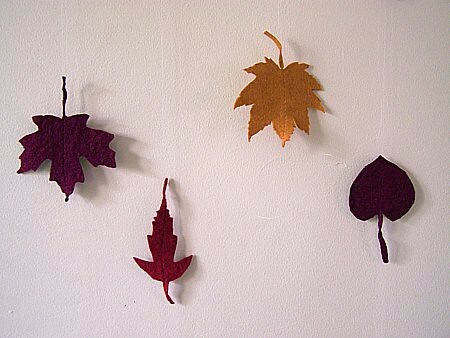 When you go to your next leaf hold the threads taut so that your top thread is not shorter than the bobbin thread. I hung my garland in the window here at the shop right by the front door. Every time someone walks in the whole thing sways and spins. It has an airy floating quality as if the leaves were falling from the tree. Some of the larger leaves were too heavy for the garland, so they are going into a fall center piece for the house.